The Saline River starts out in the Ouachita Mountains west of Benton, Arkansas with four forks. The four forks converge near Riverside in Saline County, Arkansas. The river leaves Saline County and winds on a serpentine path through Grant, Dallas, Cleveland, Bradley, Drew, and Ashley Counties. 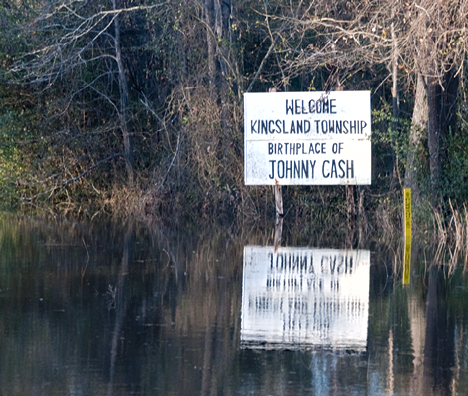 It empties into the Ouachita River near Felsanthal in Ashely County. 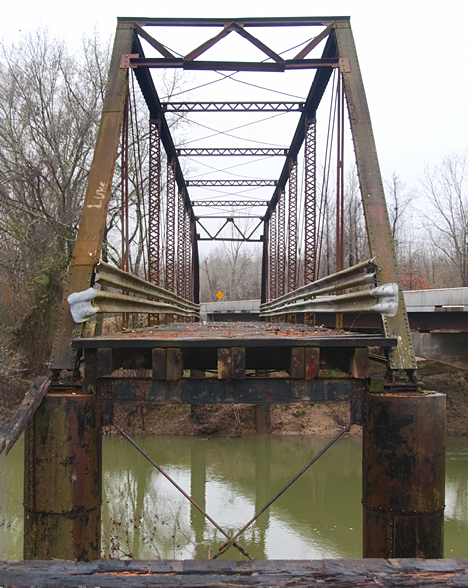 Before we go too much further, this “old bridge” story actually started in Mooringsport, Louisiana with a story about and pictures of an old draw bridge on the Photo of the Week Page at Corndancer dot com. 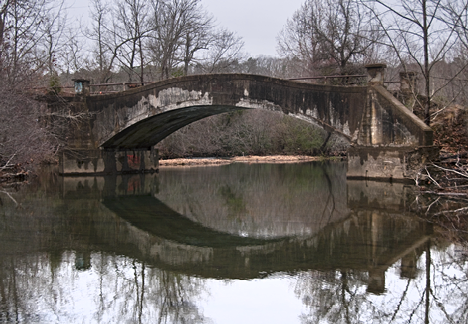 Click here to see the old Mooringsport bridge and get the story. 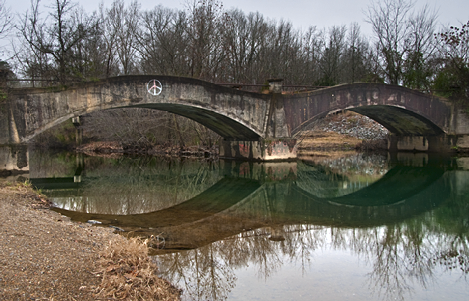 Tull Bridge over the Saline River, west of Tull, Arkansas was finished and opened for service in 1916. The bridge was in use until it was replaced in 2005. I have driven over the one-lane bridge on many occasions. 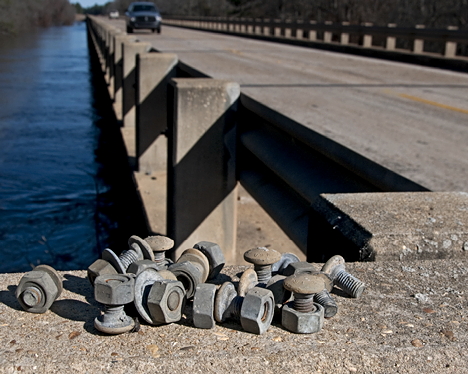 Though the wooden floor rattled loudly as you drove over the bridge, you finally become accustomed to the noise after enough trips to gain confidence that the rusty structure would indeed keep you high and dry. I first came across the Tull Bridge the mid-seventies. It was a ferrous oxide poster child and rattled like a box full of bones then, but there was a certain charm to traversing a bridge with a wooden floor. That certain charm for the most part, ameliorated the fear and trepidation brought about by the attendant sound effects. Looking at the Tull Bridge from the east bank of the Saline River. You can see the floor planking, the source of the bridge's percussion serenade as you dared to venture across it. the new bridge, completed in 2005 is visible in the picture to the right. Even the approaches to the Tull Bridge were planked with wood. The approaches did not rattle like the planks on the bridge. On most trips across the bridge, if other traffic was not present, I would stop on the bridge and get out of my vehicle just to look at the construction. Don’t tell my mother I did this. Looking south from the new bridge, you get a view of the bridge not afforded until the new bridge was completed. And you begin to think, " ... I drove across that sucker a bunch of times." 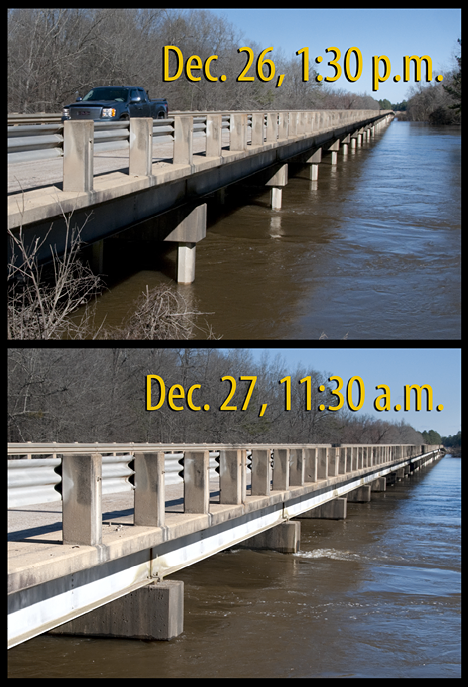 If you seriously travel central and southeast Arkansas, crossing the Saline River is inevitable. On this trip, I lost count of the number of times I crossed it. Like most rivers, as it progresses downstream, it becomes a bit but not overly turbid. Under normal circumstances, the waters of the forks, originating in Ouachita Mountains, are gin-clear. 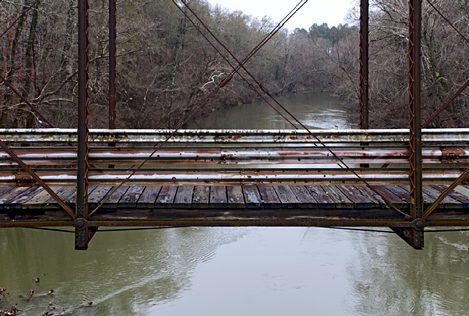 The upstream side of an abandoned bridge across the North Fork of the Saline River off Arkansas Highway 128 near the junction with Arkansas Highway 5. 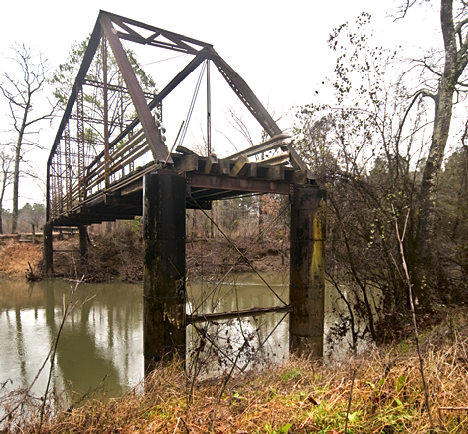 This bridge in northern Garland County, Arkansas was built by a county road department in 1931. It has been replaced by a newer bridge which I was standing under to get the shot above. The bridge is a favorite for photographers, but not at this angle. It took some delicate steps over some serious rip-rap at the base of the bridge to set up for the shot. County road departments these days, it appears, eschew the obvious aesthetic considerations their predecessors put into this one. It is graceful with a shape reminiscent of a gull in flight. Not an easy appearance to achieve with concrete. They did well and someone was thinking in the right direction to leave the bridge standing. Whomsoever you are, thanks. One can see the second arch in this bridge from the downstream side. The sturdy bridge has a classic, but bruised bridge beauty. Even in rural Arkansas, grubby graffiti shows up. It’s nice to see a couple of old bridges which did not suffer destruction. We’ll look for more. 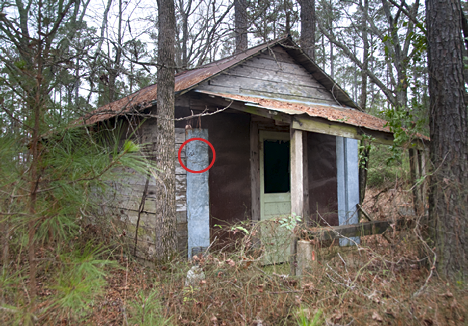 The smaller of two buildings at the abandoned "Chateau Log Cabin Hunting Club" near Carthage, Arkansas. The red circle is where a load of what appears to be number six shot impacted on the building. From the shot pattern, one can presume the shooter was standing and the muzzle of the gun was not far from the impact area. Looks suspiciously like one of the infamous, " ... I thought it was unloaded" shenanigans. See the closeup below. 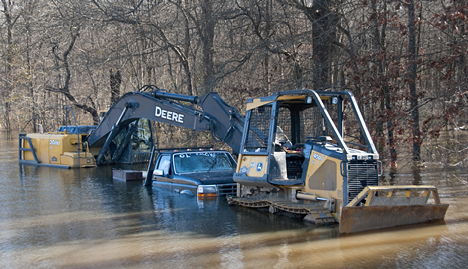 This story started on the Photo of the Week Page at Corndancer dot com, where you will see pictures of the cabin and the hunting club sign. To see those pictures and find out how this whole thing started, click here, a very cool thing to do. The two old buildings at the no longer active Chateau Log Cabin Hunting Club, just west of Carthage, Arkansas are just barely visible from Arkansas Highway 48 at highway speed. After a turn around and traversing a muddy ditch alongside the highway, I arrived on the premises. 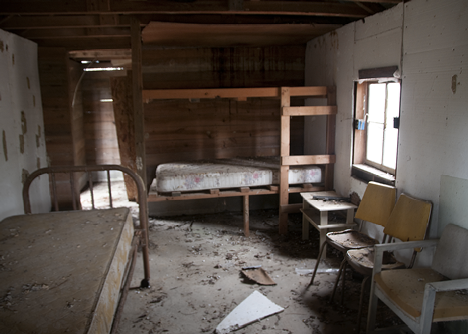 The building above has two rooms, both appeared to be bedrooms. Meals and socializing, of equal importance to the hunt in the hierarchy of deer hunting activity, probably took place in the cabin building just behind this one and to the right. 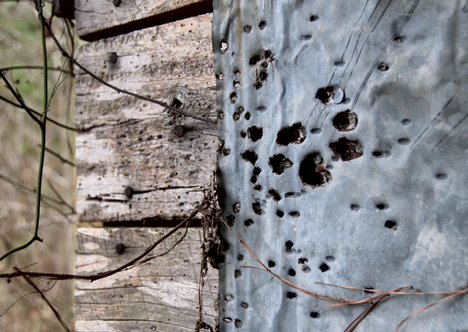 A shotgun probably loaded with a squirrel shot discharged not far from these pellet holes. We are presuming the pellet holes in the front of the building were accidentally made. One simply does not normally blast away at one’s deer club with a shotgun at point blank range. After the discharge there was probably a universal underwear change made by the members present at the time. Hunting clubs run from palatial to pedestrian, with this one closer to pedestrian than palatial. Furnishings were (and still are) for the most part, spare furniture that most families accumulate by just being a family. Creature comfort is not the big issue, but protection from the elements is and this structure could handle that job well. The Hilton, it ain't, out of the weather it is. Accommodations were tight and if you had one really accomplished snorer, he probably filled the room with his raucous nasal concertos. The blue boxes in the window are electrical outlets, no doubt added after the walls were built. The window was the easiest and quickest place to mount the boxes. They were not shooting for a mention in Architectural Digest, only to have "juice" available. Further down highway 48, I turned north on Arkansas Highway 9. North of Tulip on Highway 9, I came across Hunter Chaple Methodist Church, according to their sign, built in 1850. The church, in pristine condition is testimonial to a congregation of caring members who understand the meaning of what is truly valuable. 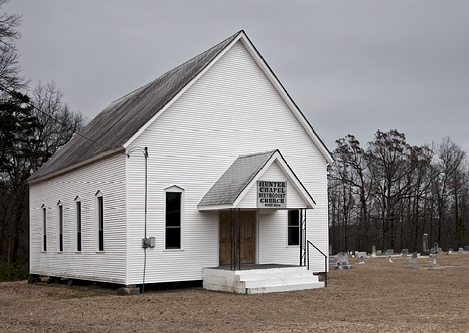 Hunter Chapel Methodist Church north of Tulip, Arkansas on Arkansas Highway 9. Further up highway 9 is Lono, home of the Country Corner, purveyors of great sandwiches among other things. 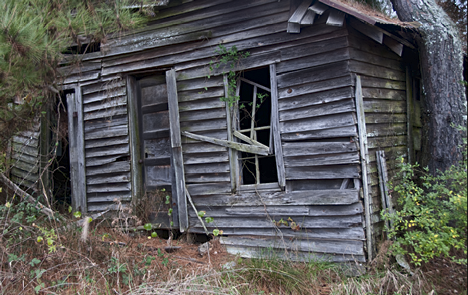 There is an old residence on its last legs across the highway from the Country Corner. I figured we had best shoot that sucker while we can. The elements are about to win. The fat lady is not singing, but she is warming up.